Sexist? "Pretty faced" was intended to be gender neutral, as looking good seems to be more important than intelligence for both male and female tv reporters getting hired. And for the record, most of the "dark side" comments that I've heard where uttered by male reporters. No sexism was intended at all, and I didn't even have a specific gender in mind when writing the comment. 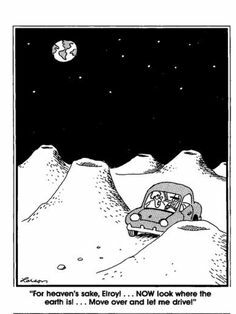 Not wanting to criticize your choice of comic art, Art, but my first reaction to this was ... "Close, but clearly they're not on the far side of the moon there". Then it hit me. 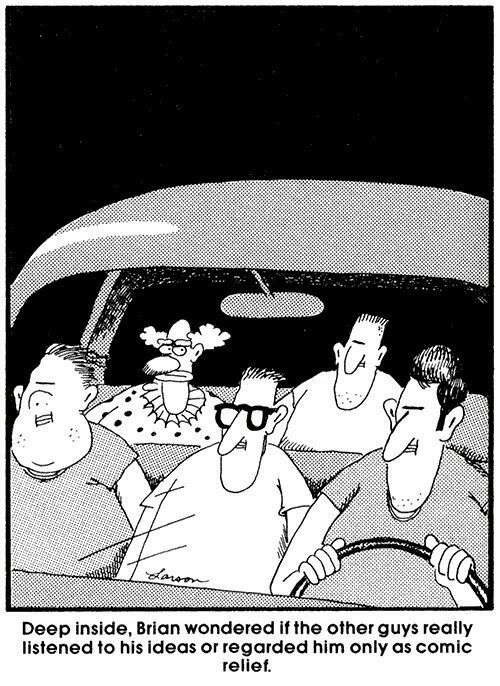 That comic is indeed from the Far Side. Deep inside, Art wondered if the other guys really listened to his ideas or regarded him only as comic relief. On the reporting of this historic mission I've been appalled by how often this landing has been said to have been made on the so called "Dark side of the Moon"! I agree, Bruce, that this is unfortunate, and I hope that over time, with enough relevant stories to report, they will do better, and get it right. Little was known about the basin until the 1990s, when the spacecraft Galileo and Clementine visited the Moon. Multispectral images obtained from these missions showed that this basin contains more FeO and TiO2 than typical lunar highlands, and hence has a darker appearance. Actually, the first species to land on the far side of the moon, are not humans, but silkworms and potatoes. You may want to count them as Chinese, but I'm not sure if that is ultimately correct. I mean, they're at least expatriates (in the older sense of the term), now. Of course this has huge implications and ramifications. Do we really believe that the Chinese landed a rover on the farside of the moon? Isn't the moon supposed to be shades of grey? Where did the pink crater come from? are you as skeptical of everyone about landing on the Moon or just Chinese people? I wouldn't go surfing near any sewers any time soon, Mark. <<In Stephen King's novel It, It is an eternal entity that can shape shift and change forms. After arriving on Earth, It would sleep for approximately 27 to 30 years at a time, then awaken to wreak chaos and feed (primarily on children's fear). The character is a menacing predatory entity which preys upon the children of Derry, Maine, roughly every 27 years, using a variety of powers that include the ability to shapeshift, manipulate, and go unnoticed by adults. During the course of the story, It primarily appears in the form of Pennywise the Dancing Clown. It apparently originated in a void containing and surrounding the Universe—a place referred to in the novel as the "Macroverse". It arrived in our world during prehistoric times in a massive, cataclysmic event similar to an asteroid impact, in the place that would, in time, become Derry, Maine. The final physical form It takes is that of an enormous spider, but this is the closest the human mind can comprehend. It's actual form is not precisely what the children actually see. Instead, the natural form of It exists in an inter-dimensional realm referred to by It as the "deadlights" [which] are never seen, and their true form outside the physical realm is never revealed, only described as writhing, destroying orange lights. Coming face to face with the deadlights drives any living being instantly insane. It's natural enemy is the "Abominable Snowman", another ancient dweller of King's "Macroverse" who, eons ago, created our universe and possibly others. The book suggests that It, along with the Abominable Snowman, are themselves creations of a separate, omnipotent creator referred to as "the Other". The Abominable Snowman and It are eternal enemies (creation versus consumption). It may, in fact, be either a "twinner" of, or the actual one of the six greater demon elementals mentioned by Mia in The Dark Tower VI: Song of Susannah, as the Spider is not one of the Beam Guardians. Is everyone okay with the Chinese space agency deciding to send whatever little biospheres they like to other celestial bodies without asking the rest of the world's opinion? Did they announce their plan to the wider community? PETA: "Silkworms were meant to become moths who flutter and explore freely"
<<Have you ever been digging in your backyard when, all of a sudden, you come across a little worm who was buried beneath the earth? If so, you probably noticed that the worm quickly ducked back down under the dirt. That’s because worms are sensitive animals who can feel fear when they’re startled—just like you and me! Silkworms aren’t very different from the earthworms found in our backyards. They’re insects who feel pain—just as all animals do. 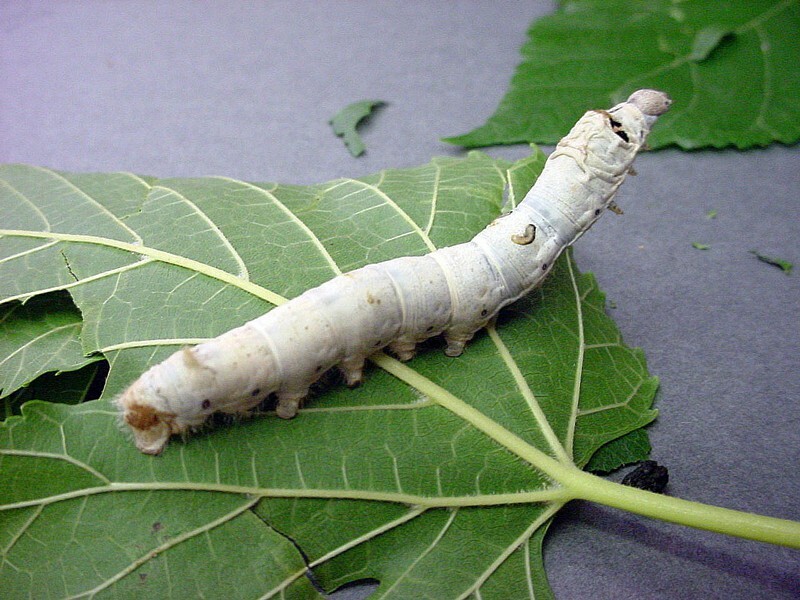 Silkworms spend a lot of time growing and transforming. They grow to about 70 times their original size and shed their skin four times in a process called “molting.” Can you imagine growing to 70 times your size?! We would all be giants! Their cocoons are made from a single thread of silk that ranges from 900 to 3,000 feet long—that’s the length of three to 10 football fields! Eventually, the silkworms would change into moths. But people use the cocoons of silkworms to make silk, and the silkworms used for this purpose aren’t allowed to go through that natural process. They are steamed, boiled, or suffocated with poisonous gas while they’re still alive in their cocoons. Without even realizing it, you could be wearing something that thousands of living, feeling insects had to die for! Silk can be found in clothing and everyday items such as bed sheets, pillows, scarves, and even hair-care products. That’s right—there could even be worm body parts in your hair! Many shampoos are made with silk. Would you want to use dead worms in your hair? We sure wouldn’t. Well, it's not like we discuss our sterilization procedures (which we know are ineffective) with the Chinese when we launch probes. Of course, there are no meaningful risks in doing this on the Moon. Mars might be a different matter, but since we're prepared to send people there, we're already prepared to contaminate it. So experiments like this really wouldn't change anything. Well, it's not like we discuss our sterilization procedures (which we know are ineffective) with the Chinese when we launch probes. Of course, there are no meaningful risks in doing this on the Moon. Mars might be a different matter, but since we're prepared to send people there, we're already prepared to contaminate it. So experiments like this really wouldn't change anything. If silkworms grow to about 70 times their original size in Earth gravity can you imagine how large they'll grow under lunar gravity! And imagine what a gross mess they'll make when they explode due to the inability of their skin to support their insides against a vacuum! Another Silk proposal finds going to the “other” side of the moon useful for scientific reasons. Speaking of gravity, I didn’t realize the difficulty involved in placing communication satellites in lunar orbit. I appreciate your answer in two ways. First, it is right of you to point out that any request for good cooperation has to "go both ways". Second, I'm glad to see that you do not have a problem with this (and that so far, nobody has expressed a reason for concern ... at least nothing that goes beyond the PETA complaint). At Caltech in 1942 Theodore von Kármán and other rocket scientists banded together to form Aerojet rocket company with the help of lawyer Andrew G. Haley. To toast the new corporation, Kármán said, "Now, Andy, we will make the rockets – you must make the corporation and obtain the money. Later on you will have to see that we behave well in outer space...After all, we are the scientists but you are the lawyer, and you must tell us how to behave ourselves according to law and to safeguard our innocence." Indeed, twenty years later Haley published the fundamental textbook, Space Law and Government. Some previous international cooperation has ignored the Chinese. Now that they have made their presence known and set their ambitions high, I think it important for the rest of the space-faring nations to be more inclusive of them. They are a party of the Outer Space Treaty. As a result of discussions arising from Project West Ford in 1963, a consultation clause was included in Article IX of the Outer Space Treaty: "A State Party to the Treaty which has reason to believe that an activity or experiment planned by another State Party in outer space, including the Moon and other celestial bodies, would cause potentially harmful interference with activities in the peaceful exploration and use of outer space, including the Moon and other celestial bodies, may request consultation concerning the activity or experiment." I didn’t realize the difficulty involved in placing communication satellites in lunar orbit. Ah-ha, good plan. Nature’s Way before herky-jerky. Sort of like using the dirt from tunneling under a wall to build a ramp over it. Chang’e 4 views its landing site, including the Yutu-2 rover just to the south, in the first panorama taken after landing, on 10 January 2019. Nice to see that they fixed the overly red color issue. Now the moon's surface looks real, instead of [like] a faked Mars' landscape. Last edited by BDanielMayfield on Mon Jan 14, 2019 6:52 pm, edited 1 time in total.